High Energy: combines de-boned duck and turkey with sweet potato as a low GI carbohydrate source to give your active dog all day energy. 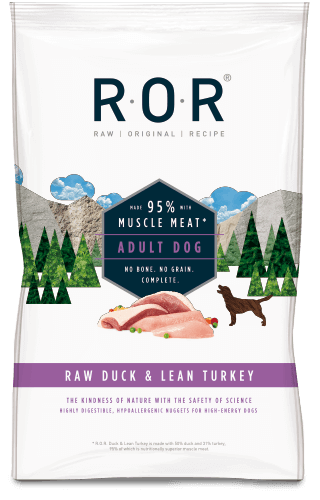 R·O·R Duck & Lean Turkey is made with the highest standard, prime cuts of nutritional bone-free meat and does not contain any indigestible bone. Using bone-free meat means that R·O·R contains the perfect balance for essential amino acids, energy requirements and nutritional qualities needed for adult dogs, as well as being easily digestible. Calcium 0.37%, Phosphorus 0.24%, Crude protein 10.50%, Crude Fibre 0.50%, Moisture 69.10%, Ash 2.10%, Total Oil 11.98%.